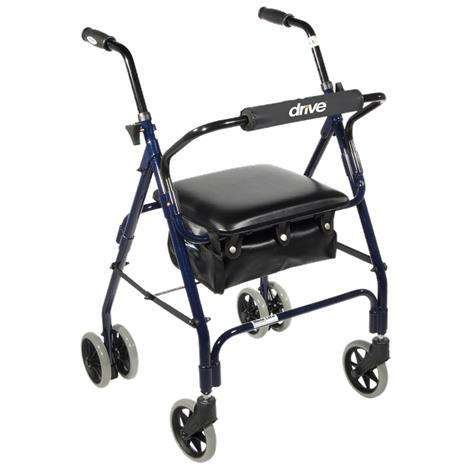 Drive Winnie Mimi Lite Four Wheel Aluminum Rollator features spring loaded push down lock which operates easily by poshing down on handle and ensures safety. 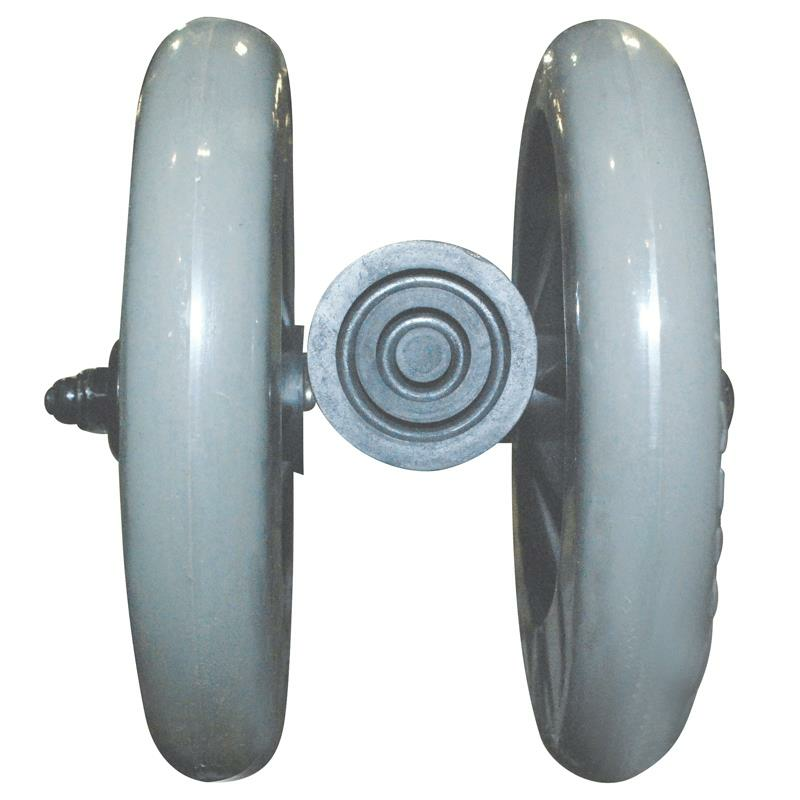 The large six inch casters with soft grip tires are ideal for indoor and outdoor use. It comes with padded seat with zippered carry pouch under seat for added privacy and security of personal items. Handles easily adjust in height with self-threading knob. Call us Toll-free at 866 316 0162 for Exclusive Price Offers! Please read these instructions before assembly or use of this Rollator. This Rollator must always be assembled and fitted for the user by a qualified Drive Medical Authorized dealer. Before using your new Rollator please ensure that your weight is within the weight capacity of this unit. This Rollator will require very little assembly and the assembly can be completed without tools. - Open your Rollator. Push the folding hinge until straight to secure the unit in the proper position. - Place the open loop of the folding strap over the tube of the backrest assembly. - Slide the backrest assembly into the open receptacles on the front (lockss are on the rear) of your new Rollator. Make sure that both sides of the backrest are firmly in place all the way at the bottom of each receptacle. Secure the backrest into place using the nylon screws included on the unit. - Place a handle bar with the pre-assembled Locking Loop Locks in each handle bar receptacle and adjust to the desired height. 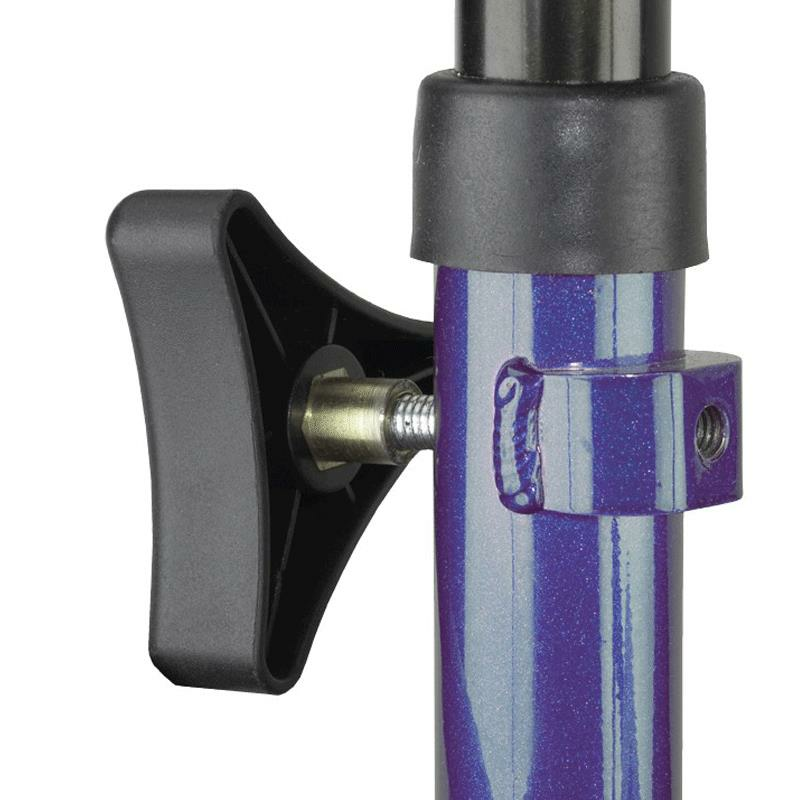 - Use the height adjustment knobs and bolts to secure the handle bars in this position being cautious to ensure that the bolt heads are properly mounted within the hex opening on the inside of each handle bar receptacle. - Test and adjust the lock mechanism tension to ensure proper and secure braking before use. - The black tote bag simply attaches to the frame of the unit beneath the seat. When properly positioned, the tote bag is open, directly under the seat when the frame is open. Always engage and disengage wheel locks on both sides simultaneously. - TO SLOW DOWN OR COME TO A TEMPORARY STOP — Push down slowly by applying weight on the handles until unit slows down or comes to a temporary stop. - TO TEMPORARILY LOCK WHEELS IN POSITION — Once seated, rear wheels will automatically lock until weight is removed. - TO RELEASE WHEEL LOCKS — Remove weight until wheels start moving freely. This unit is easily folded from the user’s side of the unit by grasping the folding strap (black cloth strap) located under the hinged seat and lifting the unit by this strap. The unit will fold as lifting for easy storage and transport. This unit may be folded with the tote bag in place. - Please read all cautions and warning labels before using this Rollator. - This unit is designed to be used as a mobility aid, creating a natural gate as the user walks securely with their primary weight distribution between the handlebars with the unit in front of the user. - If Rollator has a seat, always engage the locking mechanism on the push down locks before using the seat.